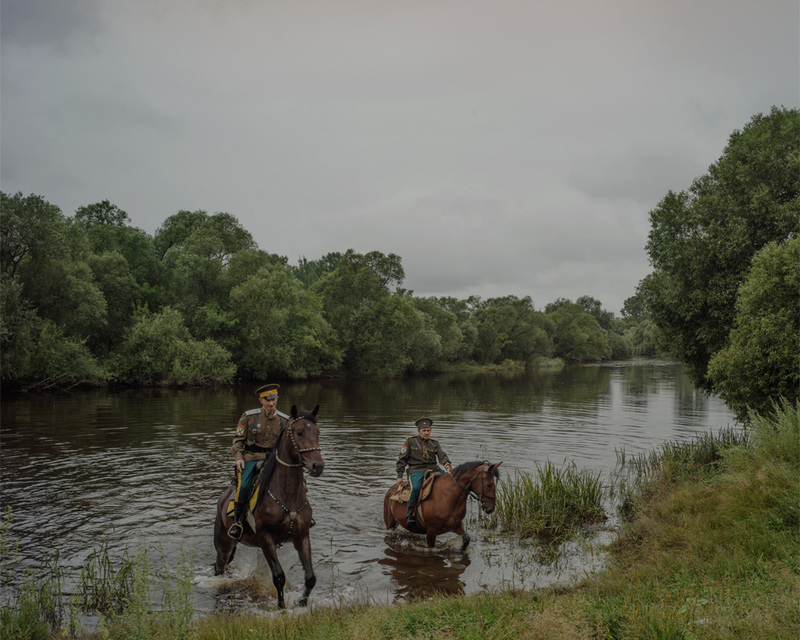 A pair of Russian Cossacks ride their horses near Moghilovka, a village in the Lazo region, where two rivers, the Amur (or Heilong, in Chinese) and Ussuri (Wusuli), form the borders of the northeastern-most corner of China’s Heilongjiang province. 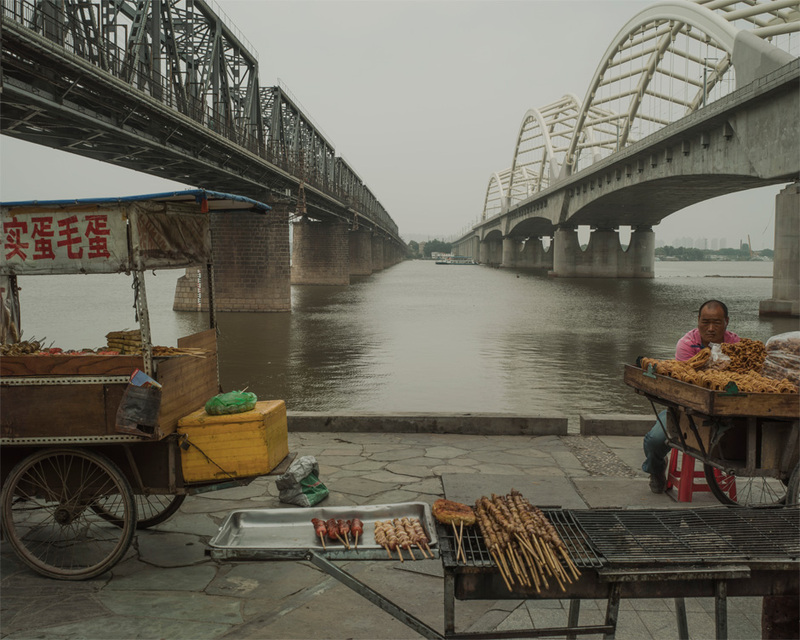 A food vendor awaits customers on the bank of the Songhua River in Harbin, beneath bridges used by Chinese Eastern Railway. Chinese in name alone, the railway was built on a strip of land controlled by Russia that was exempt from the jurisdiction of local Chinese law in a deal brokered between the two countries after China lost the Sino-Japanese war. The old bridge, seen at left, was built by the Russians at the beginning of the 20th century; the newer one was built by the Chinese. 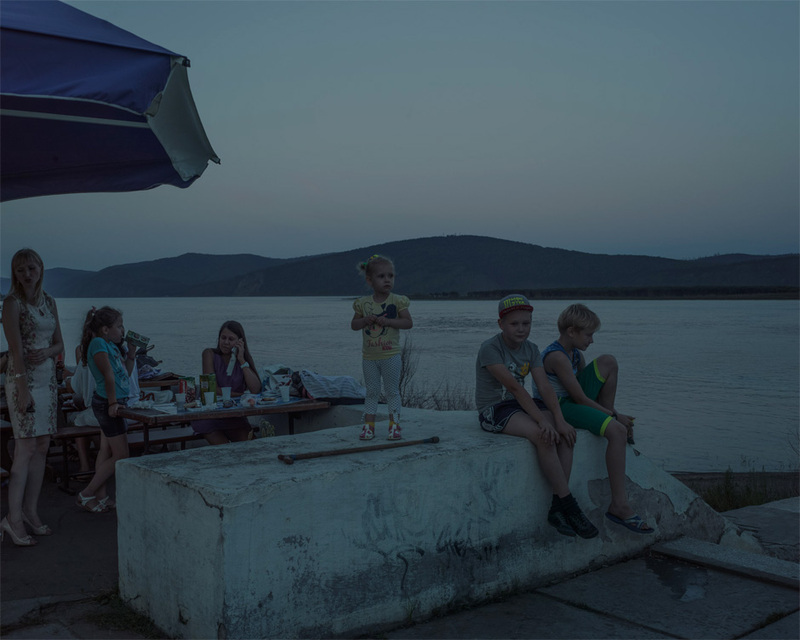 A Russian family sits at a riverside café in Komsomolsk-on-Amur at dusk. The town was largely built using volunteer labor from the Communist youth organization Komsomol, hence its name. Construction of the town was aided by the use of slave labor from nearby prison camps. 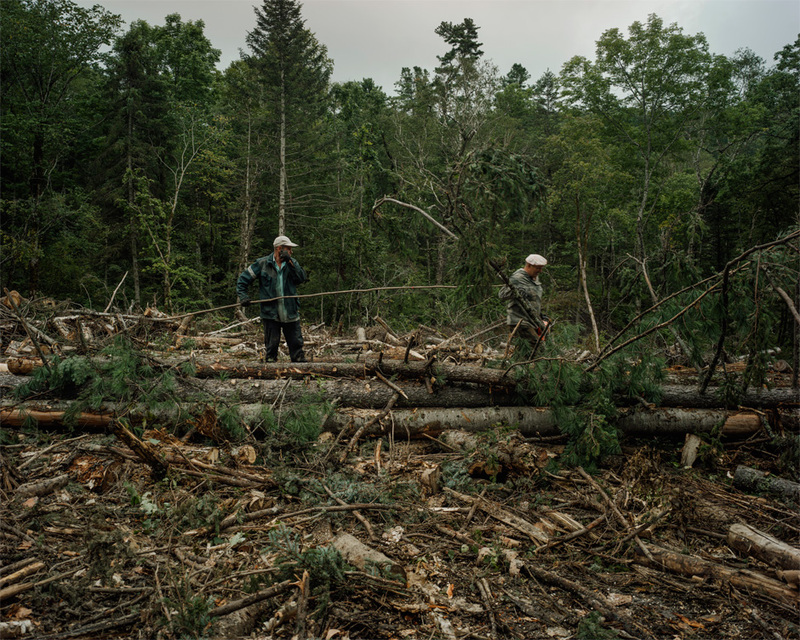 A team of lumbermen works in the Lazo region. Six laborers make up a team and live on-site for stretches of three months. 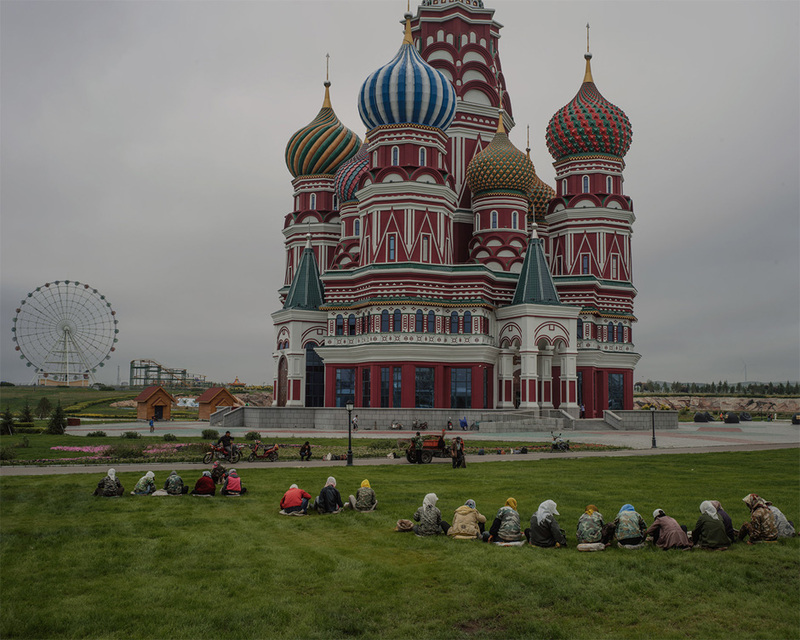 Construction workers take a break from building the new “Matryoshka Village,” an amusement park that pays tribute to the famous nesting Russian dolls. 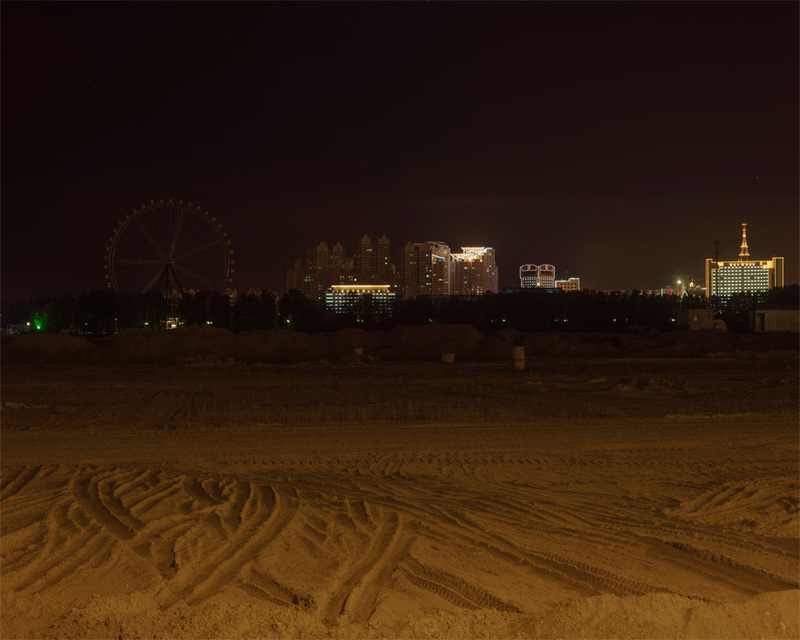 It is an extension of an earlier “Matryoshka Square,” in Manzhouli, China. 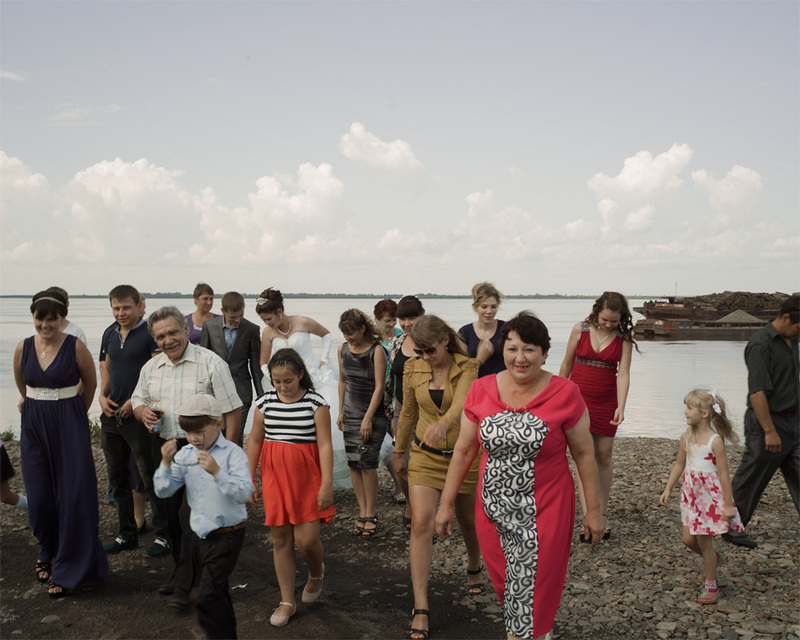 A Russian bride and groom celebrate with members of their wedding party on the banks of the Amur River in Troitskoye, Khabarovsk Krai. A group of Chinese people picnic on the bank of the Songhua River in Harbin. Formerly a small fishing village, the city expanded rapidly in the 19th century as Russian engineers constructed the eastern portion of the Trans-Siberian Railway. The city of Wudalianchi, in Heilongjiang province close to the Russian city of Blagoveshchensk. 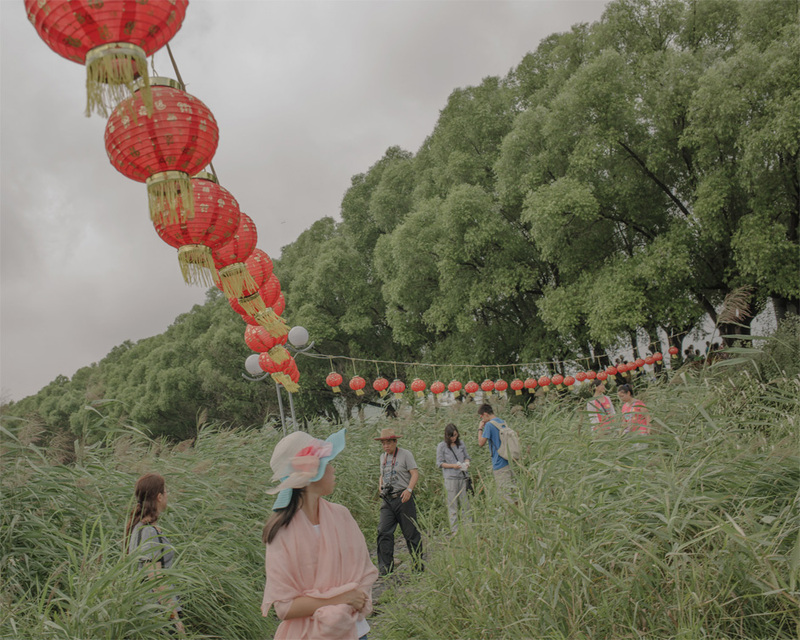 It is also becoming a new resort destination for Russians with some help from advertising campaigns touting Sino-Russian cooperation and tourism. 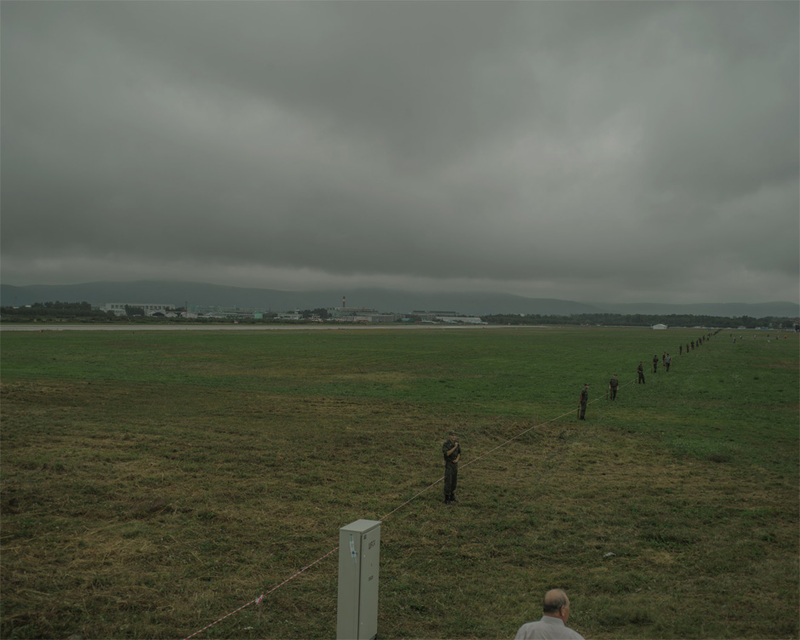 Soldiers line up to patrol an airfield during a public event for the Sukhoi Aviation Company, a Russian government-controlled company, in Komsomolsk-on-Amur. The company, which produces both military and civilian aircraft, is the only major employer in the city, and almost half the city’s 250,000 residents work for it. 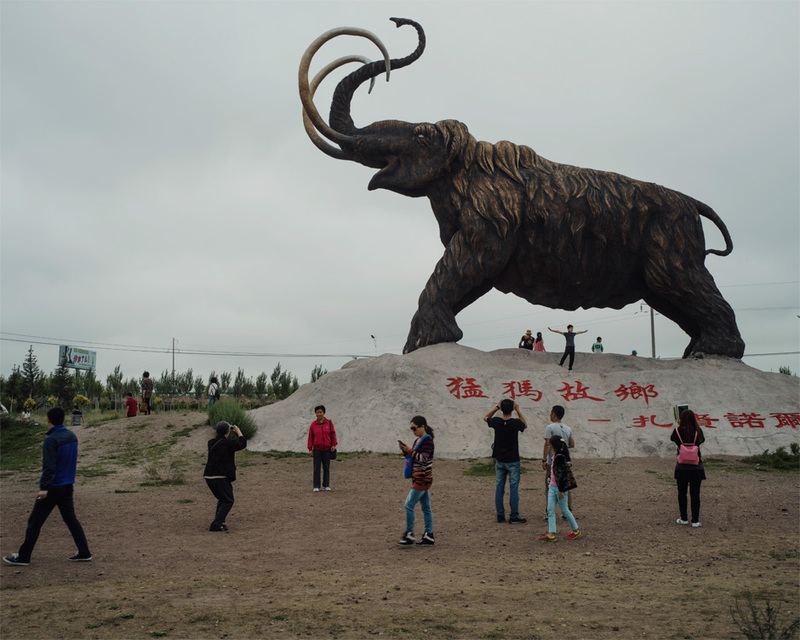 Tourists visit a wooly mammoth statue, built to commemorate a fossil discovery, in Mammoth Park in the Jalainur district of Manzhouli. 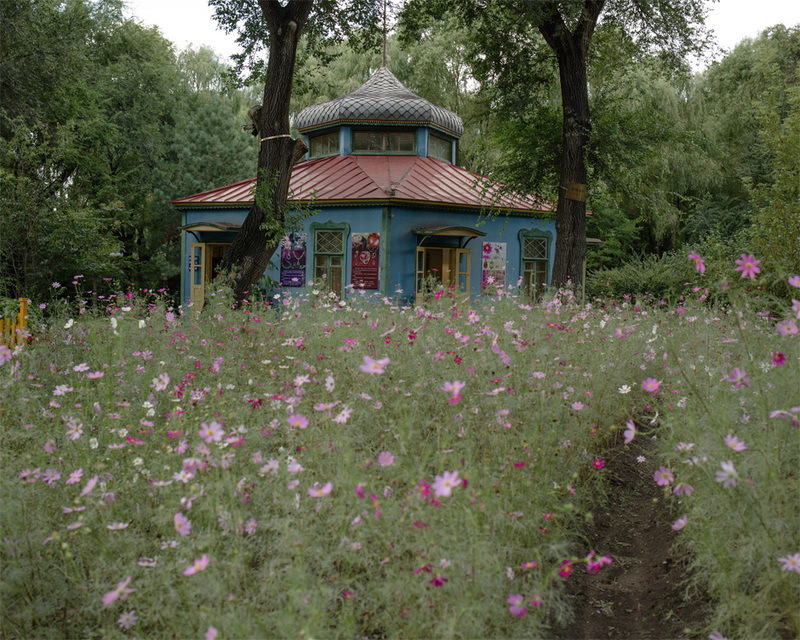 A Russian-style building in the “Russian Village” in Harbin. 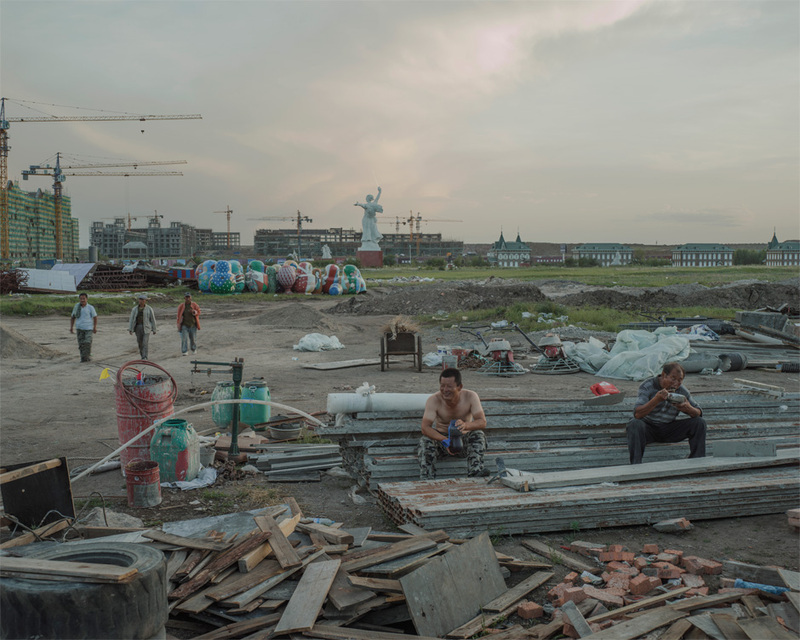 Once a fishing town, Harbin became a destination for Russians with the construction of the Chinese Eastern Railway and their numbers swelled following the October Revolution in 1917. The Russian “Harbinsky” population brought onion-domed cupolas and art nouveau architecture to the city. 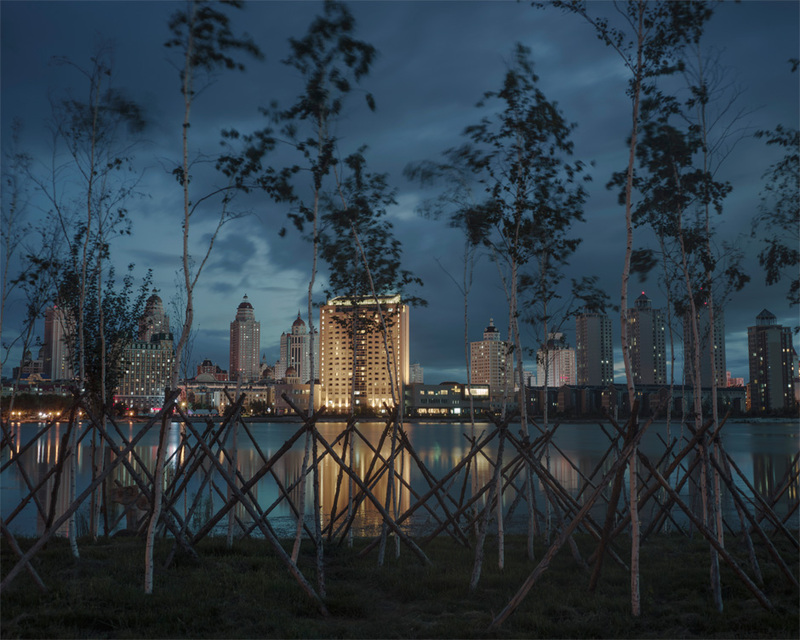 From across the Amur River in Blagoveshchensk, Russia, the Chinese city of Heihe glows in the night. 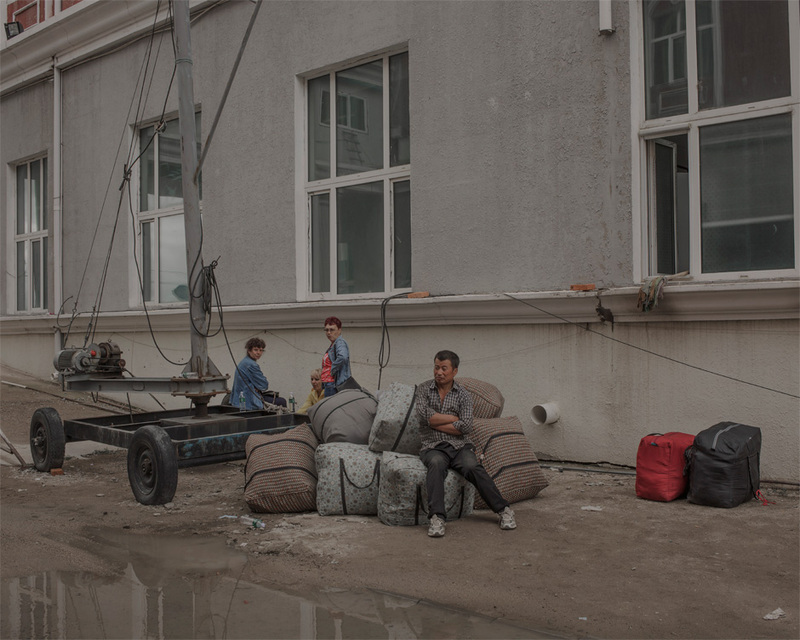 Travelers wait for a bus to take them to Russia from the border town of Manzhouli, Inner Mongolia. In 1992, a border trading district was established in Manzhouli, making it one of the first land border cities designated as an international port of entry, transforming it into a prosperous trade hub. 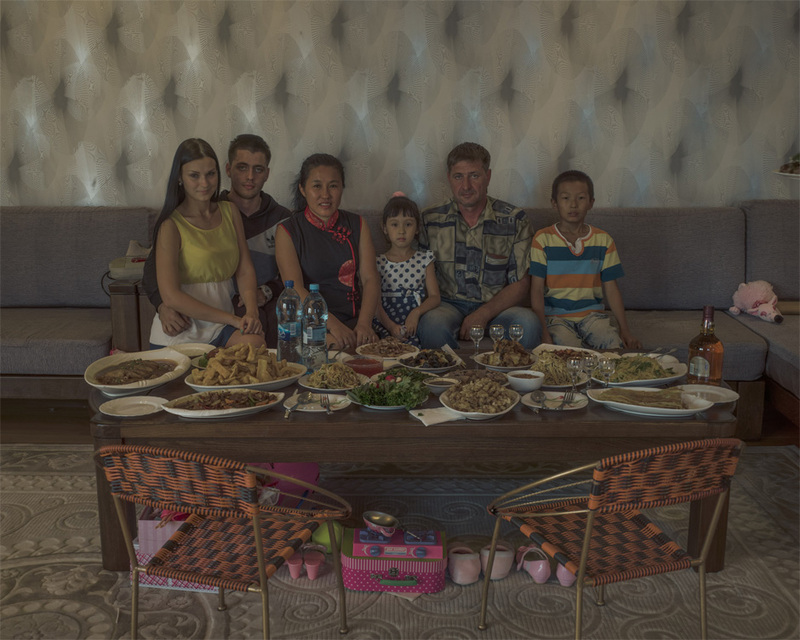 Li Lihua and her husband Vadim sit with family members in their Blagoveshchensk home. Li moved to Russia from Harbin in 1993 after the Soviet era ended and migration was once again possible. Today, she runs a successful business in construction and restoration. Prior to the mid-19th century, most Chinese migrants to Russia were convicts, hunters, fishermen, or traders. 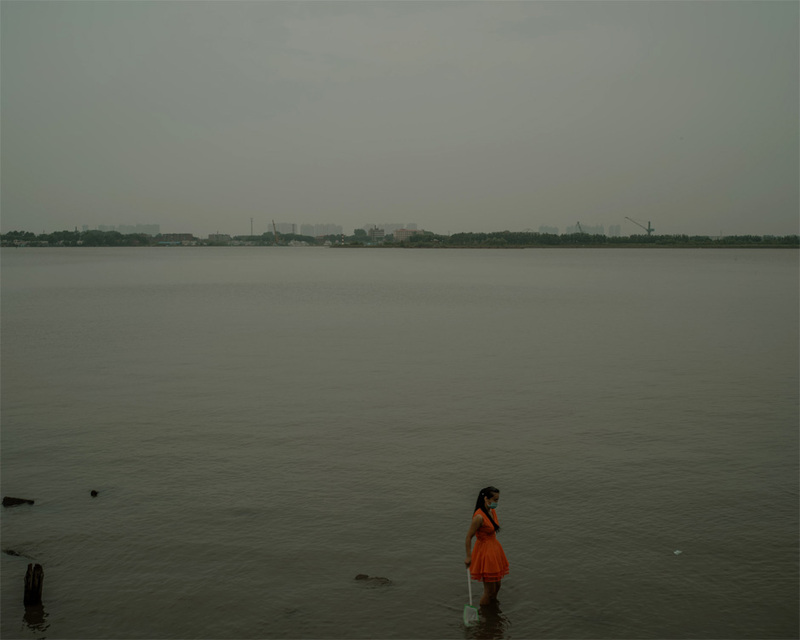 A woman wears a facemask and holds a fishing net while standing knee-deep in the Songhua River in Harbin. A tributary of the Amur, the Songhua is another point of connection between the two countries. An explosion at a Chinese chemical plant in November 2005 spilled 100 tonnes of nitrobenzene into the Songhua—a spill local officials were unable to conceal when it became clear the pollutants would quickly drain across the border into Russia. Pi Jun, 53, from Jalainur, looks up from his lunch break on the construction site for the new “Matryoshka Village”—a Russian-doll-themed amusement park— in Manzhouli, Inner Mongolia. From 2008 until 2014, Pi worked in Chita in Zabaykalsky Krai, almost 400 kilometers away, where he earned the equivalent of 4,500 RMB per month. At the time, he says, that was more than what he could have made in China. 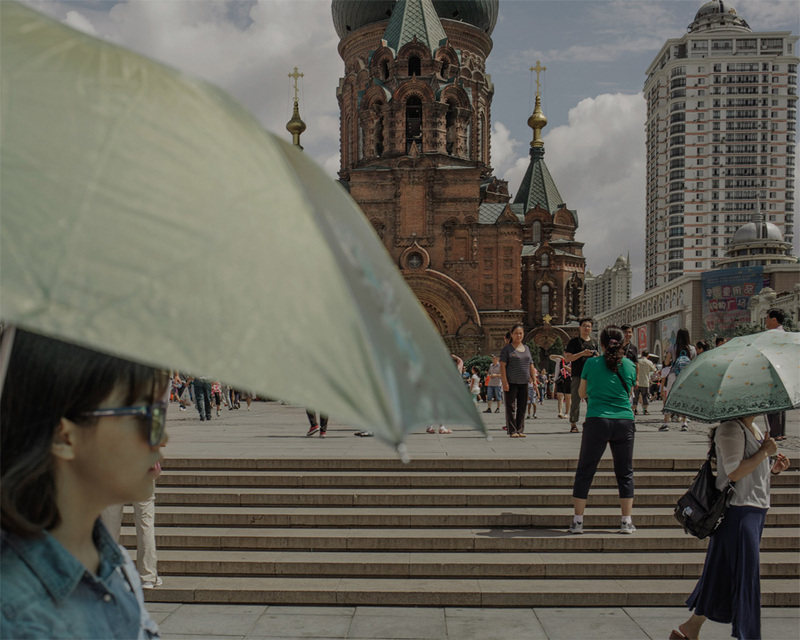 Visitors take pictures in front of Saint Sophia Cathedral in Harbin. The original church, built on this site in 1907 to mark the 1903 completion of the Trans-Siberian Railway, was constructed from timber. In the 1990s, the church was rebuilt, and it is now a tourist destination used primarily as a backdrop for wedding pictures. A replica of Moscow’s St. Basil’s Cathedral used as a science museum stands in the Jalainur district of Manzhouli, China. 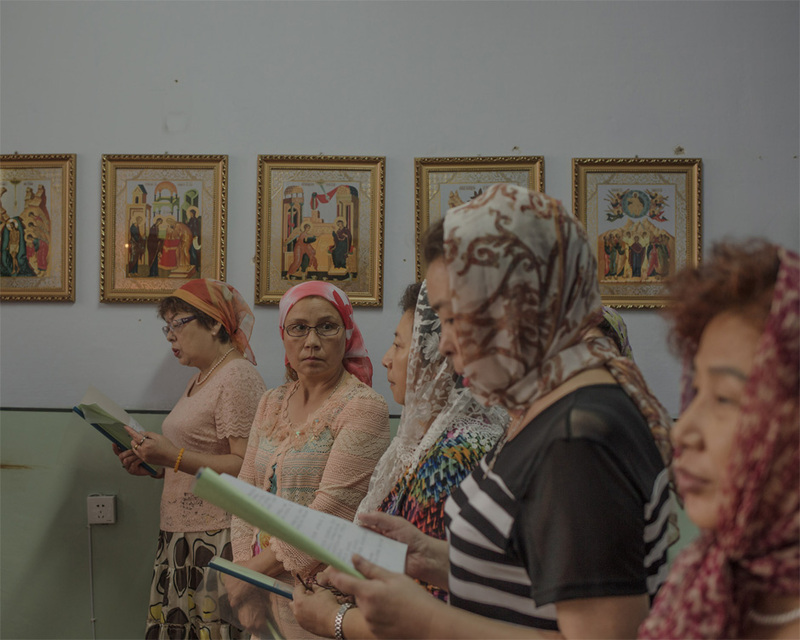 Russian Orthodox in Harbin attend Sunday prayers in a private apartment not far from the Church of the Protection of the Mother of God, officially closed for renovation. The Chinese government does not recognize Orthodox Christianity as an official religion, but in October 2015 the Russian Orthodox Church ordained former banker Yu “Aleksandr” Shi, of Harbin, its first Chinese priest to be ordained in 60 years. 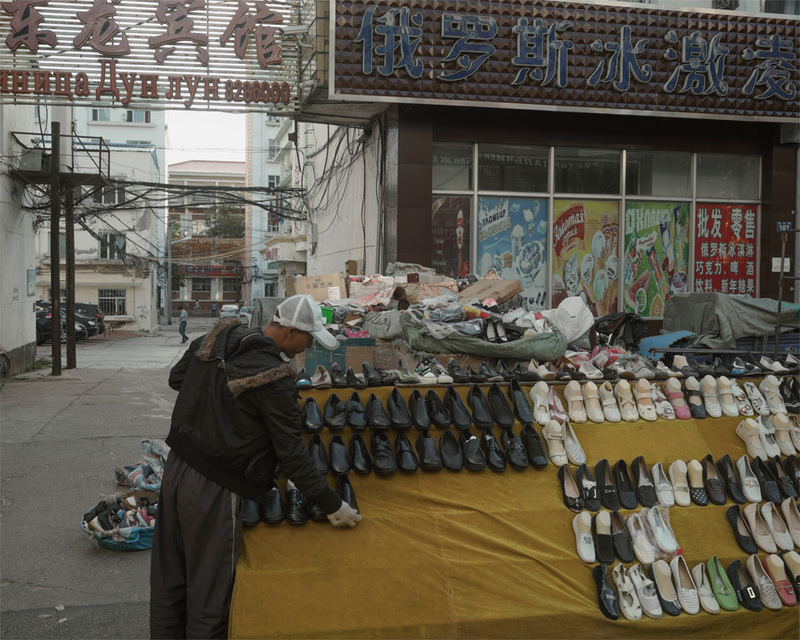 A shoe peddler sets up his wares in the city center of Heihe where the city street transforms into a huge market for Russian customers arriving from Blagoveshchensk, across the Amur River. Until a decade or so ago, it was a rural backwater, but a special economic zone was established in the city in the mid-90s, and the city has since grown to a population of close to 2 million. 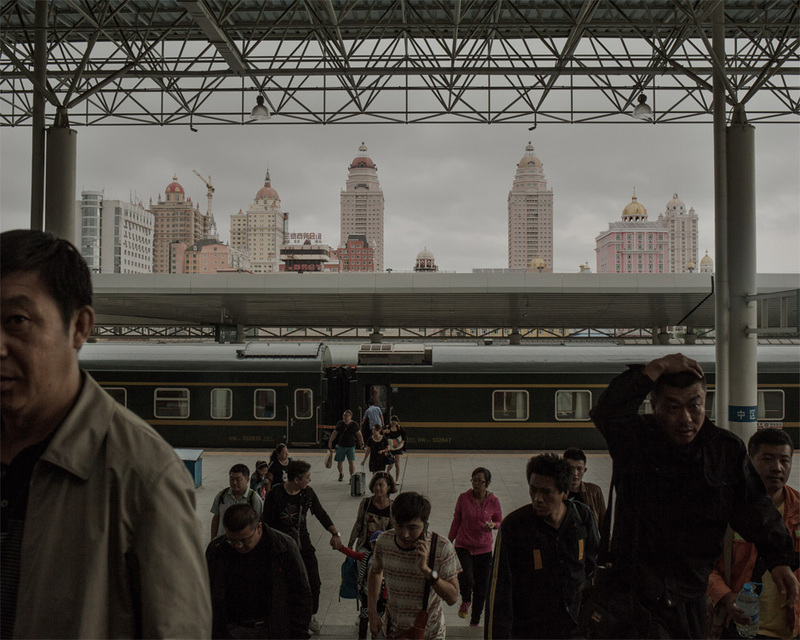 Passengers disembark at the Manzhouli railway station. 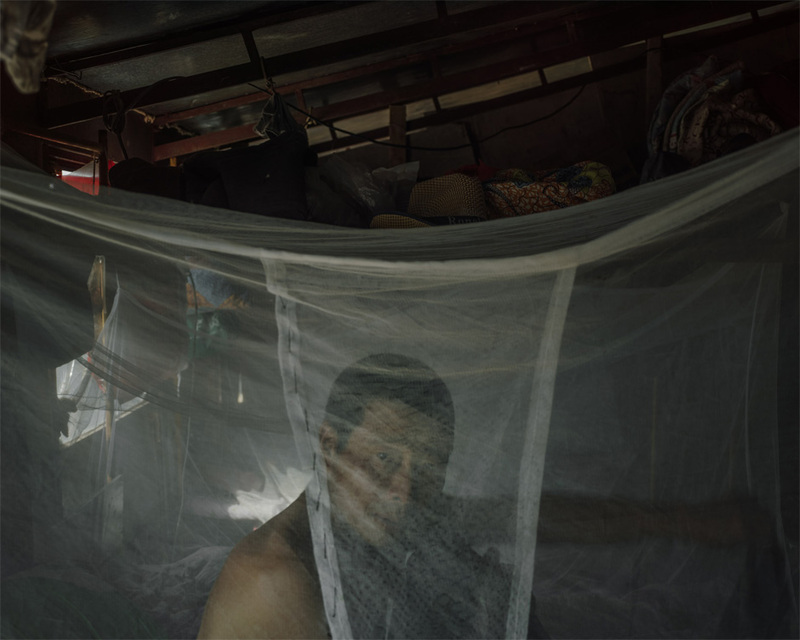 This essay is part of China Borderlands, ChinaFile’s new project to document life on China’s borders, in partnership with the VII Photo Agency. Monteleone produced this essay as a ChinaFile Fellow. Across the frozen Ussuri River that marked the boundary between China and Russia, two armies stared each other down. Soon they would clash, as they did almost every week, on the ice. The Chinese swung halberds and hooks; the Russians advanced like medieval knights with great spears, while others stood by to knock down with maces any Chinese warrior brave or lucky enough to make it through. This was the winter of 1968, and far worse weapons were on hand, from the Type 56 rifles the Chinese carried to the tanks and BM-21s (mobile rocket launchers) in the Soviet camp to the missiles sitting in silos hundred of miles away, tipped with annihilating fire. But both the Soviet Army and the People’s Liberation Army were holding back, provoking and brawling with one another while under orders not to be the first to fire. No war came. But fear of the Soviet Union lingered for years. 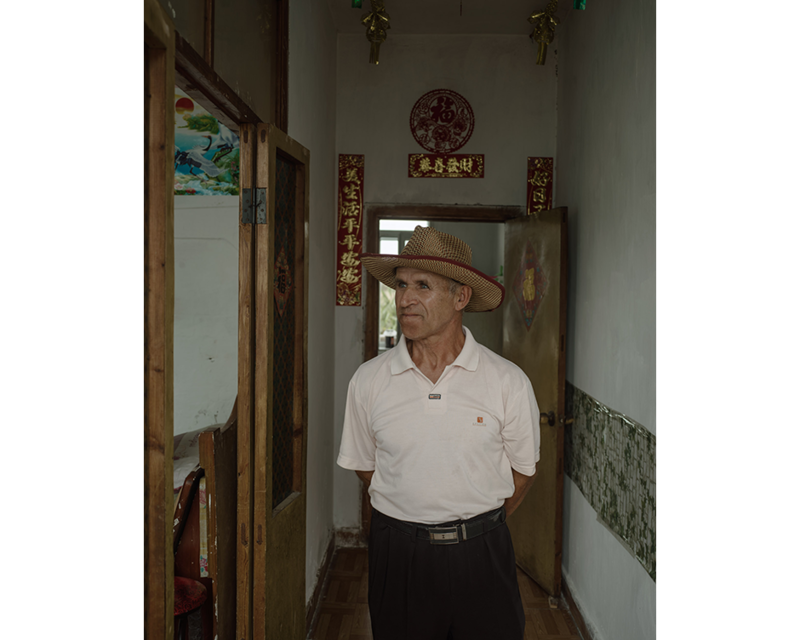 In Tangshan in 1976, when the earthquake struck the city’s heart, survivors’ first thoughts were that the Russians had nuked them. The Chinese poured vast sums of money and arms into Afghanistan in the early 1980s, working alongside the Americans and the mujahedin to fill the secret flights back to the Soviet Union with the bodies of Russian boys every month. Today, Moscow and Beijing are closer than they have been in nearly 70 years. Chinese media repeats the Russian nationalist narrative of events from Ukraine to Syria. A brief ambiguity over the annexation of Crimea ended up with the term “annexation” itself verboten, and the event instead referred to as “Crimea’s return to Russia,” or “the integration of Crimea into Russia,” echoing China’s revanchist ambitions in Taiwan and elsewhere. At Chinese conferences on topics from military to media, Russians are everywhere, far outnumbering Europeans or Americans. Russians are playing out China’s own patriotic fantasies; resistance to the West, reclamation of lost territories, the macho posturings of Vladimir Putin. The existing paranoia of the Chinese state about U.S. influence is being doubled by a steady drip of Russia’s conspiracy theories. —From James Palmer’s “A People’s Friendship.” To read the full essay, click here.